The flowering crab apples, Malus Rosaceae, are excellent floral trees with the added bonus of small usually edible fruit. 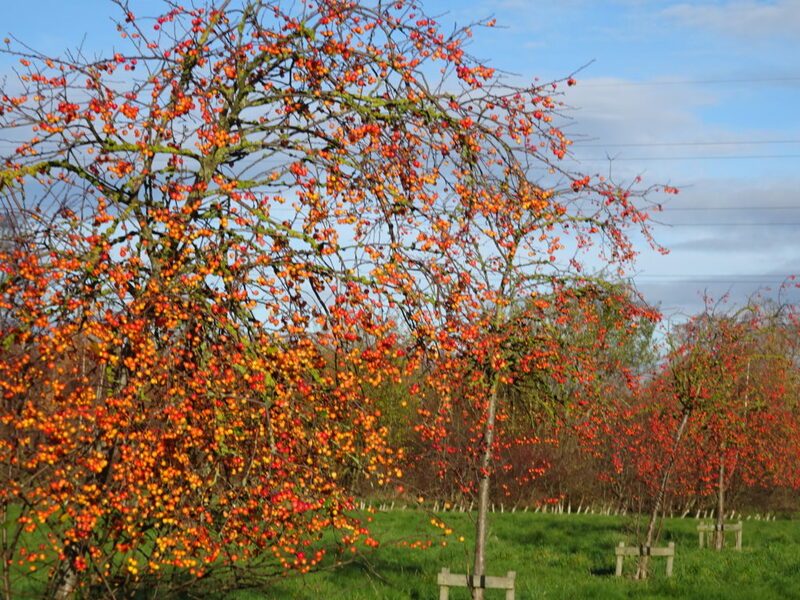 The Malus Red Sentinel above has a profusion of small hard red autumn fruit that can be admired in the garden, left to feed birds, converted into a jelly or added to other food dishes. Crab apples generally contain a deal of pectin and are seldom eaten uncooked. Golden Hornet is a small tree with white flowers producing a large crop of small yellow fruit. John Downie perhaps the best fruiting large conical crab apples of bright orange to red. Jay Darling is ornamental with large, deep red flowers and crimson tinted foliage. Eleyi has purpleish shoots and very decorative purpleish fruit in Autumn. Slightly later flowering and a good pollinator. Profusion is a fragrant hybrid with large wine red clustered flowers. Ox-blood red fruit make this one of the best Crab Apples. 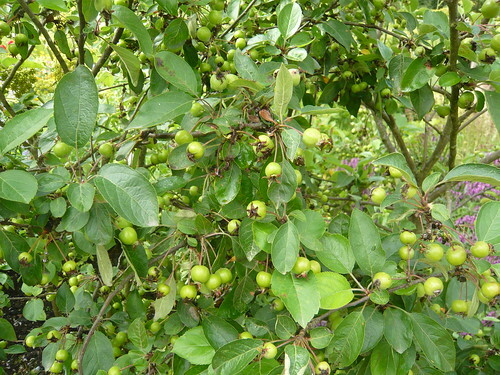 Tips – Crab apples are very useful for pollinating your apple trees. Select varieties that flower at different times in white pink and red. 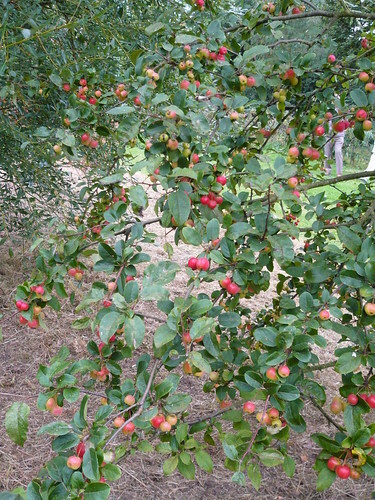 Crab apples, like other Malus have produced fine crops in 2010. The above example of ‘Evereste’ is growing cordon style up to 4 feet high. I have practiced what I preach with a new Red Sentinal tree taking pride of place in my garden. It was requested and delivered for my 7oth birthday! As I said earlier this week this is an updated post for National Tree Week 2018. Make crab apple and chilli jelly. I made crab apple jelly for the first time this year and it is delicious and such a vibrant colour. I don’t know the varieties used as the trees didn’t belong to me – small, oval, yelllowy-orange crabs in August then cherry-like red crabs in October. The latter were so petit and gorgeous it seemed a shame to just boil them up so I pickled them instead with very pleasing results. I think they’ll make nice christmas gifts and can’t wait until next year to do it again.